Little kids want to do what we grown ups do. Harper likes to help me cook or bake sometimes just by throwing in a little salt or stirring a mixture in a bowl. Or even washing the dishes with LOTS of soap. Naturally, most items are too big for her or any child to manage. The adult world is big. Big plates, big spoons, big sofas, big cars, big houses, big lives, big everything. Their worlds are physically much smaller. They can manage better in a smaller world. They can learn when more scaled down versions exist. With smaller versions of real life things, children can step into our world and pretend to be grown ups. It’s exciting, it’s fantasy, it’s the best pretend you can imagine. I remember it well. My childhood dollhouse was my way of living in a grown up world. Thirty-five years later, I decided it might be a good way for my daughter as well. I began to restore my dollhouse and have it ready for her fifth birthday. Over the course of two years, I must admit I had fun remodeling, repairing and refurbishing my childhood dream house. At times, it felt like an escape back into the small world where I once fantasized about the family and home I would have one day. I kept some pieces of my original collectibles, and even left some aspects of the original decor. But I added new paint, wall coverings and a few new pieces to give it a more modern, relatable feel. It was so much fun! I was playing with my dollhouse all over again! In truth, I can see where my time as a little girl playing grown up in this miniature world honed my instincts about organization, structure, and my sense of order. I can also see where it fueled my creativity and design skills. Most of all, the doll house allowed me to imagine a bigger, grown up life in which everything could be as I wanted with just the move of a chair in the tiny bedroom or moving a desk from one bedroom to another! Pretending at its best! 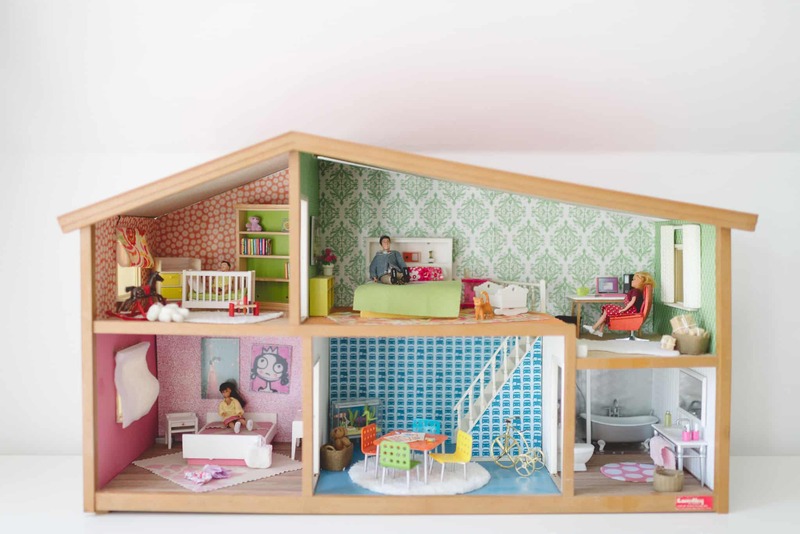 On some level, I think dollhouses help little girls to develop a set of values and behaviors that might serve them when they become adults and life becomes bigger than the make believe family inside the doll house. This two-year process of getting this dollhouse ready was more than a redesign effort, or even a trip down memory lane. I began to see how small worlds and big worlds and little girls and grown up girls share so much in common. My dollhouse was going to be more than a tangible gift of make believe worlds. It was going to hopefully inspire my daughter with thoughts and visions of what life she may wish for or hope to have one day. Oh such a great post! Love the dollhouse and I’m sure Harper does to! How cute is this dollhouse! 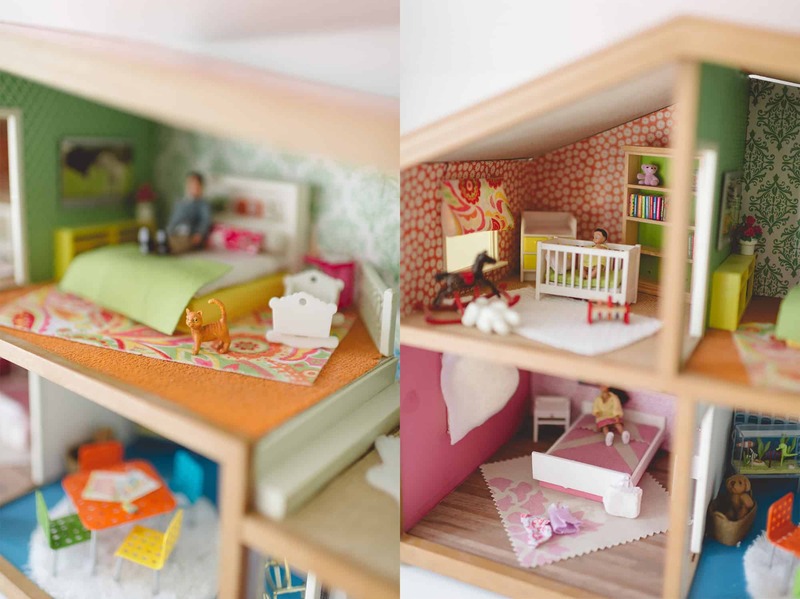 I love how you redid your old dollhouse to pass it on to your daughter. Not only is that adorable but also holds sentimental values – a perfect gift for a little girl! My daughter is turning five in October – at this age they’re such princesses and imagination is always strong at play! You’ve given me inspiration for her gift. ;) Also, I love how you see beyond the ‘tangible’, giving the reader a refreshing perspective into your thought process. Your positive zest for life truly shows in everything you do! 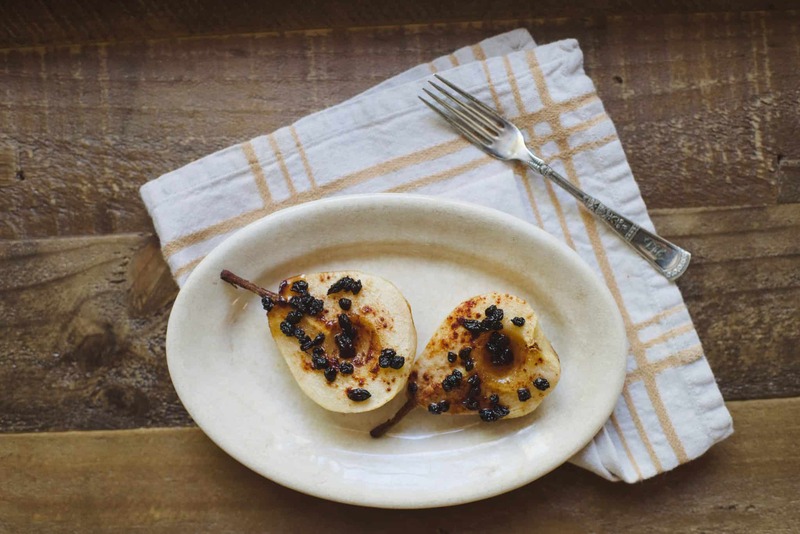 Love your cooking show! I had this exact same dollhouse! So fun to see it reimagined. I know your daughter will have many years of enjoyment playing with it! 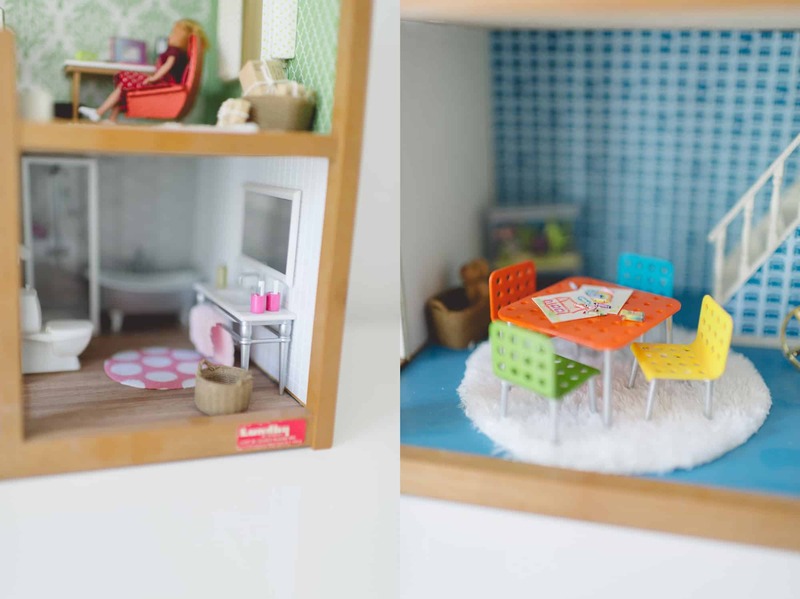 This is such an adorable doll house and it looks like you did an awesome job remolding it. I bet Harper will get many hours of enjoyment playing with it.